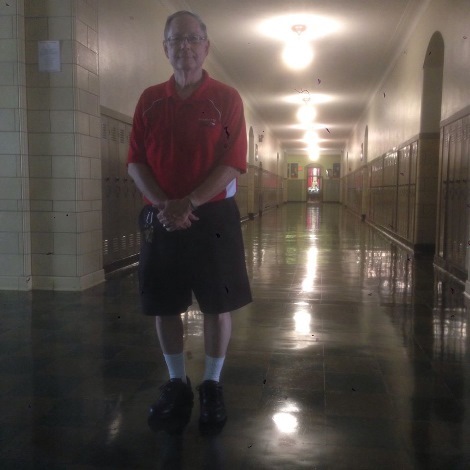 Retired Wyandotte High School teacher compiles new history of school – Welcome to Wyandotte Daily! Years ago, a severe storm knocked two letters off the front of Wyandotte High School. Craig Delich knows which ones were replaced. Delich also knows about an escape hatch in the principal’s office, and where it goes. He also knows where the ghosts were first seen in the school. And he knows how the senior class president was kidnapped one year by the junior class to prevent the tradition of “passing the robe,” and graduation. “Images” is 240 pages, with 400 photos and lots of school memorabilia, much of it not published or seen before. The book is expected to be released in November. It costs $39.95, but if pre-ordered it is $5 off. The book certainly includes the famous names and celebrities, and sports stars, Delich says. Moreover, it will reveal photos that have never been seen before and things nobody would expect. Delich estimates about 30,000 graduates live in the metro area now. “They have a camaraderie,” he says. The book starts with the first school, in 1886, Riverview Elementary at Seventh Street and Pacific Avenue. “It drew from the community, every ethnic group, rich and poor,” he says. The history of Riverview school tells how these areas were formed. Delich says at that time, parents had to pay for their children to attend. “Only the rich got to go, and only the whites got to go,” he notes. But the Riverview community was an early and strong proponent of public schools so that all children in the community attended. 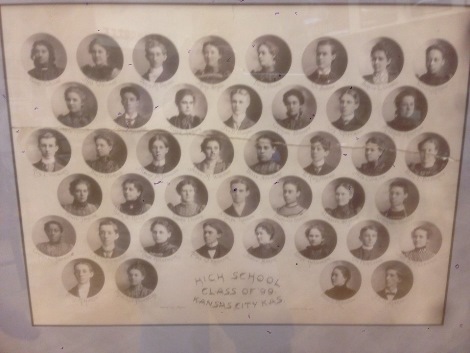 The book shows a photo of the first graduating class with faces of all colors. “This book is a generational history,” he says. Delich says at that time, Riverview was also located on a mud bank. “They were all dirt streets,” he says. Students had to hop on a train for a short distance and walk the rest of the way to school. The train ran to the Missouri side and back to Seventh Street and Riverview Avenue. Delich includes photos showing the train going in a tunnel under Minnesota Avenue. “That story has to be told,” he says. The book includes period maps which show how the downtown area was in the early 1900s. As the town grew, Delich says the streets were widened, and the school was moved to Seventh Street and Ann Avenue, and became “Wyandotte Academy.” It was expanded by 10 rooms, and later with mobile classrooms. But the students outgrew the building again. The school then moved to Ninth Street and Minnesota Avenue. The name changed, too. In 1901, the school officially became “The Kansas City Kansas High School. It was followed by “Central High School” in 1925, and finally to “Wyandotte High School” in 1928. 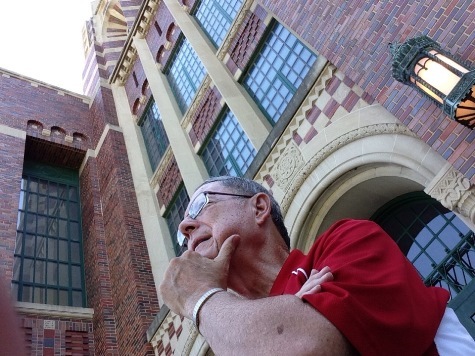 Aside from the school’s history, Delich is on a mission to change attitudes about the school. Every community changes, he says, and wanting everything to stay the same is not realistic. Delich is adamant about letting people know that just isn’t the case. “I want them to realize they’re being lied to!” he exclaims. 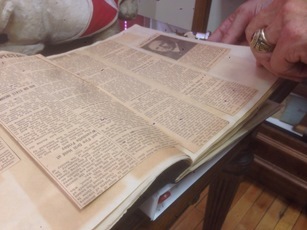 Delich has old issues of the school newspaper, and the only surviving copy of the last issue. Those entire 19 pages are reprinted in his book. He says it is important because it includes stories written by students, faculty, a photo of the laying of the cornerstone, and ads. “This is not just a school,” he says. Delich was determined to use the same colors on the pages, and a special technique common in the 1800s called “vignetting,” and put in the same flourishes that were used on the pages of the old yearbooks. “I want every page to look like that!” he informed his editor sternly. Delich thought about doing the book as far back as 2002, but the idea never really panned out. “I dropped the whole thing,” he says. Then, in the summer of 2014, he received a letter from a publishing company in Virginia Beach, Va., that specializes in books that highlight hometowns. The Donning Company could do a limited edition. Delich pulled out his old outline, which he said would certainly work now. And so, last August, he started gathering all the photos and artifacts and got started. He enlisted the help of others and over months of hard work the maquettes took shape. The publishers were then ready to put the material into a template that looked like a regular high school yearbook. Delich would not have it. Delich wanted vintage ads, and photos of the places where students worked and played. He wanted these extras to give the book the feel of the times. “This community loves this school,” he says. While working on the pages, Delich also went to businesses in Kansas City, Kan., in hopes of getting financial sponsorships. He has asked various groups if he could advertise the book on websites and social media, but was told because his book is a for-profit project, the rules won’t allow that. He did, however, receive one donation. “Ed Asner gave me $100,” he says. So, Delich has to date put in more than $62,000 in the book and nearly $13,000 in the CDs that were included in the first 250 orders. To break even, he needs to sell about half of the 3,000 first run. “This is my life,” he says, with 250 sold, so far. Last, Wyandotte High School finally moved to 25th Street and Minnesota Avenue. It was built on a golf course. The book has early photos of the school during construction. “I love this school,” he says. 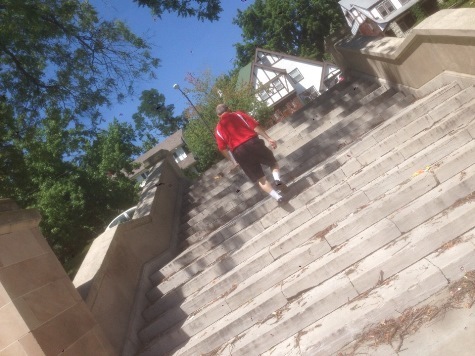 He says the first track team didn’t yet have an athletic field and practiced on an empty lot. Delich notes the teams earned many state and national titles. He says the basketball team had no gym and practiced at the YMCA. They also brought home a number of championships. “The story about sports is phenomenal,” says Delich. Delich grew up in KCK in a house at Seventh Street and Greeley Avenue. His dad walked the beat as a cop. He went to Wyandotte High School. Delich tried out for basketball, but never made the team. He never missed a game, though. “Always be a Bulldog,” he says. However, says Delich, before the Bulldogs, the school mascot was a Jayhawk. Delich was a Wyandotte teacher, too. He taught anything to do with social science and history. His wife, Glena, taught preschool in KCK. She passed away a few years ago. “She spent all her life teaching,” he says. 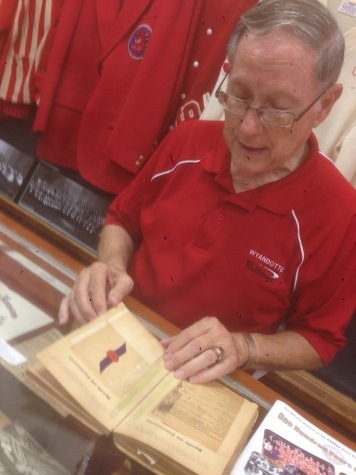 Delich says one of the prized artifacts is a scrapbook called “The Fire Book.” It was put together by former principal J.F. Wellemeyer, after the school burned on March 4, 1934. The last fire drill was on a Friday. The fire blazed on Saturday. No one even knew the scrapbook existed, for decades. Then, one day in the 1990s, a former teacher was wandering around a flea market in Ozark, Mo., looking for kiln-fired old crocks. He happened to see some school-related stuff. He bought it all and brought it to Delich. Delich says it was like finding gold, and the Fire Book will be reprinted in its entirety. Rebecca Tombaugh is a freelance writer in the Kansas City area. Story and photos copyright 2015 by Rebecca Tombaugh. To order this book, go to the book publisher’s website at http://www.donning.com/wyandottebook and click on the “Buy Now” button. Wyandotte is party of my family history and my own personal history. I wish my kids could go to a school with such history. I am proud to have learned and taught in such a beautiful school and with such amazing staff and students. Would love to buy Craig’s book. Wyandotte was a great school with so many memories. Too bad you cannot tour the High School. Where can we order the book. Renee – Craig Delich was one of my teachers at Wyandotte, I was told directly from him they do have an occasional tour. Contact the high school and ask – I’m sure they’ll pass the information along to the right person on any available tours in the future. We’ve noticed that the publisher has an electronic order form online. Since we are not the publisher, we cannot put an order blank online for you to print out. However, you can contact either the publisher at the above web address or the author at craigdelich@yahoo.com to see if they will send you an order form. going to have to order the book. 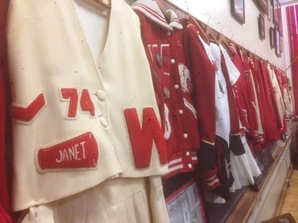 Class of 1983…..lots of history there in the school. I wrote a small story about it for the yearbook. 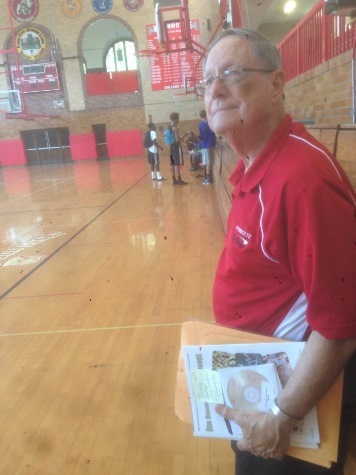 Was on the staff junior and senior years. What a great story. Thanks Mr. Delich for keeping it all alive! I graduated in 2000. I had Mr. Delich for American Government in 1999, Lori. My mother, Virginia Woodland Frackowiak, passed away two years ago. She went to Wyandotte early ’40s. She would have loved this book. I’d love to order a copy of this book. Class of “63”. I had Mr. Delich as my American History Teacher at Wyandotte, I believe it was my Senior Year, and I graduated in 1991. 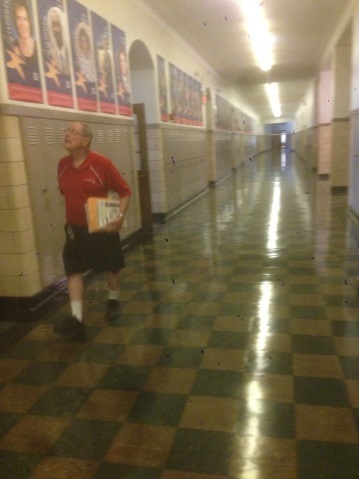 Mr. Delich’s class was one of my favorite classes, and he, one of my favorite, most memorable teachers!!! You had to work in his class, it wasn’t just a free ride, you definitely had to earn your grade but he made the information interesting to learn. I remember him as a historian of Kansas City, Kansas and Wyandotte High School!!! I would love to buy a copy of his book, I grew up, my entire life in KCK and I graduated from Wyandotte, which has always given me great pride, I too am always a Bulldog!!! I will order a book. Class of “46” my sister,Elizabeth class of “44” lives in Wichita. 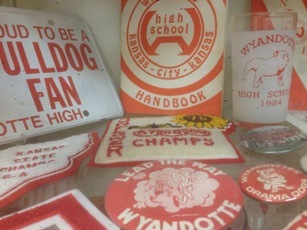 I graduated from Wyandotte in 1967, which may seem like a century to some of the younger people. My name is Deborah Hardin Huskey, and I would like to hear from some graduates in 1967. At that time the school was very beautiful and stood for something in KCK. Everything must have changed. I don’t understand why visitors are not allowed in the school. 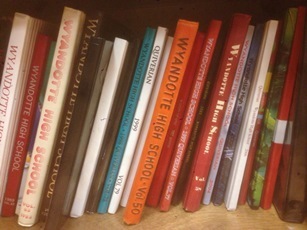 I recommend the book “Images from the history of Wyandotte High School” by Craig Delich .” He researched his subject well. Living near San Antonio, Texas, makes it prohibitive for me to visit in the KCK area, however I was able to do so in the fall of 2017. I would have enjoyed an escorted tour thru the building, even just a brief one. Class of “1946” Go Bulldogs! Mr. Delich gives a memorable presentation and the students today, can get a grin for history of where WHS began, and a perspective on where it is today in their lives and ours.